A sailboat Weather or wind vane is many times found near the ocean or a lake. They can vary in sizes depending if you place it on a kitchen roof, Garden stake or a barn or house roof. 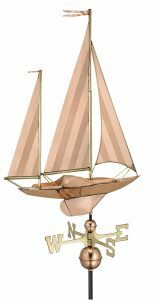 The antique copper sailboat weather-vane is still very popular and reflects the nautical history of our country. A sailboat wind direction indicator is a nice feature on any roof top. 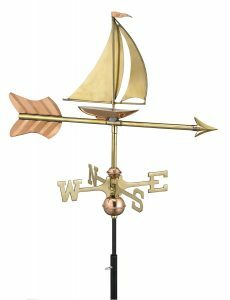 As always we only looked at the highest quality sailboat weather vanes to assure that you get a nautical weather vane that will last for many years. The Montague company makes some great weathervanes. 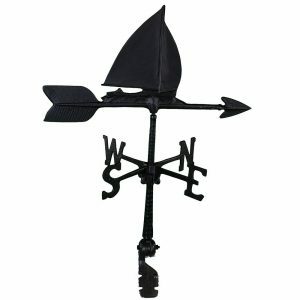 This 24 inch sailboat wind vane is made of recycled aluminum and is hand cast. The finish is black enameled backed and this will make this nautical wind vane last many years on you roof top. 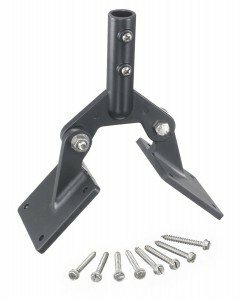 The base will fit most roof pitches and is fully adjustable for that purpose. This wind van is made in the USA. We have found a 4.6 star rating our of 5 for this nice weather vane. The Good directions company does not need any introduction when it comes to wind vanes. 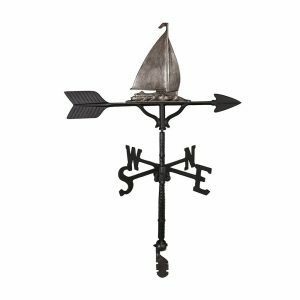 This Cottage 8803PRT sailboat weathervane is about 21 c 28 x 3 inches when assembled and their all weather roof mount that is very well constructed will ensure a perfect rotation with just a little wind. This size is great for smaller buildings like a shed or a gazebo in you yard. 4.4 star rating. There are 3 version available. The copper and polished copper will show a nicer look than they have already over time due the weather influence. 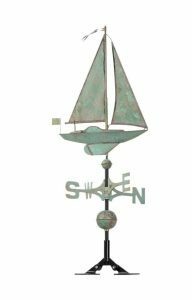 A little higher priced but really beautiful is this Good directions 9907P large sailboat weather vane in copper. The assembles size is 28 x 58 c 18 inches and the sailboat by itself is 28 x 40 x 4 inches. The single point contact turning will let this beauty turn even by the slightest wind direction change. Comes with the very well and made out of solid brass directional’s and copper spacer balls. The roof mount is not included unfortunately and has to be ordered separately. Whitehall productions makes some amazing products. This 48 x 4 x 19 inches large sailboat weathervane is one of them. The weight is a little over 16 pound and that describes the quality already. Verdigris is a bright bluish-green formed by atmospheric oxidation on the copper underground. This product is hand hammered and this will give it the old look in a very natural way. An other company that makes some great weather vanes is the Montague company. This 32 inch weathervane ornament is made of Swedish iron and comes with and adjustable roof mount base that will fit most roofs. The ornament sits on a black enameled weather vane base that can be set to your directions.